I’ve been an advocate for parent involvement in education for many years. But throughout those years, one of the most challenging tasks has been to define this two-way partnership. What is it that parents and teachers need to understand about working together? And why is this partnering so important to student success? 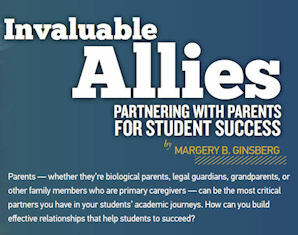 In Invaluable Allies: Partnering with Parents for Student Success, Margery B. Ginsberg, PhD, an associate professor in the College of Education at the University of Washington, provided some informed answers to these questions. I would add another assurance from the teacher perspective — that families are going to respect and learn from teachers! If we look at educating children as a systemic process that involves learning between families, teachers, and students, then we get closer to understanding the importance of partnership. For true partnership, parents and teachers must develop opportunities for two-way communication, through which learning is the key goal. Both must take responsibility to develop positive outcomes for children. Successful parent involvement means mutual participation by families and teachers. Ginsberg provides numerous ways teachers can take the lead in facilitating parent involvement by opening channels for positive communication. We all understand teachers are very busy, but taking the time to make a 5-minute phone call or write a brief note is a gesture that invites parents into partnership. Asking open-ended questions of parents in order to learn from them can help a teacher better understand a particular student. Questions might include, “What does your child like most about school?” “Are there questions you would like to ask me or things you would like me to know that would help me be a better teacher to your child?” Ginsberg explains how questionnaires can be used to get feedback from parents, for the purpose of facilitating student learning. Teachers have many opportunities to express their availability and openness to parents, including school open houses, back-to-school nights, and parent conferences. Ginsberg says teachers must use these opportunities, not only to communicate one-way but to seek information that only a parent or guardian can provide. Mutual goal-setting is a great way to encourage parent involvement, working together to collaborate to improve children’s learning. Ginsberg suggests that “clarity, alignment, and evidence of success are three objectives that problem solvers” must keep in mind. When parents have the opportunity to participate in problem-solving, they also become part of the solution. “Homework’s value lies not in a grade but in the student’s value for learning,” says Ginsberg. When teachers brief parents on their philosophy and system of homework, parents can better support their children at home. Teachers facilitate a positive home-school relationship when they help parents understand the value of assigned homework, how parents can best assist, and the type of home environment that is most conducive for study. While Ginsberg focused her article on specific ways teachers’ partner with parents, it’s equally important for parents to reflect on the partnership with their child’s school. Parents not only play a role in their child’s academic education, they share the lead with teacher-counterparts to develop a healthy, well-adjusted, and successful young adult. Respect, honesty, compassion and other internal strengths are first modeled and taught in the home. How parents build two-way communication with teachers also sets a path for student learning. For two-way communication to flourish between home and school, behaviors that nurture collaboration are essential. 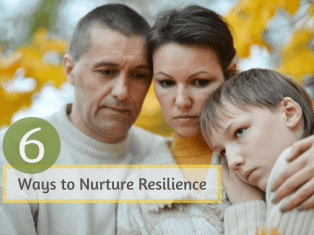 Whether you are a parent or teacher, there are certain behaviors that are helpful and others that are harmful when it comes to building school communities that thrive. 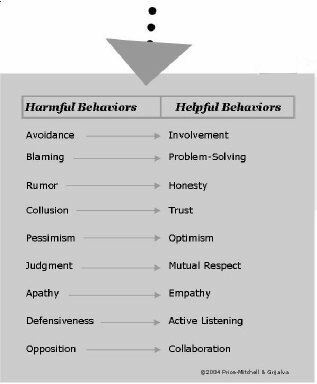 The model below shows the types of behaviors that help and harm parent-school communities. Harmful behaviors can be transformed into helpful ones by people who consciously facilitate positive change. For schools to successfully engage parents (and parents to successfully engage schools), everyone must pay attention to building a culture that models and rewards the “helpful behaviors” shown by parents, teachers, and students. I urge you to read Ginsberg’s article in its entirety and to share it with parent leaders and teachers at your school. The more we understand about parent involvement and partnership, the more we are able to improve student learning and life success. For more information about Ginsberg and how to contact her, see her bio at the University of Washington.